Russian composer, pianist and conductor. Autograph signature on front cover of programme. Rachmaninoff has signed along the right border next to his portrait photograph by Kubey-Rembrandt Studios. 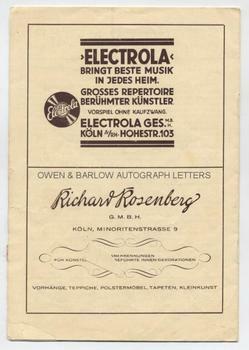 The concert was given in Cologne on 3rd November 1928. 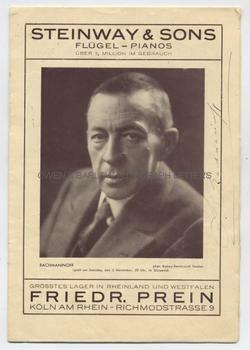 Rachmaninoff performed Preludes of his own composition, as well as pieces by Liszt, Chopin and Bach-Busoni. Rachmaninoff's signature is large and bold but is written with a fine nib that gives it quite a light appearance. The illustrated programme measures approx 10 x 8.75 inches and contains 16pp. It is complete. There are some separations along folds of spine but it is still firmly stapled. There is a paper chip to the lower left corner of rear cover but the paper piece is still present and tipped on to the rear cover. All else VG/near fine.